Garden of Aaron: The Tallest and Skinniest Bluebird Ever? Symphotrichum laeve 'Bluebird' (smooth aster) in the middle here between a DeGroot's Spire arborvitae and an unhappy looking inherited azalea. In the foreground, you can see a small clump of false heather (Cuphea hyssopifolia), which I understand is used as an evergreen shrub in the Deep South, but will almost certainly behave like an annual here. This is my first year growing Symphyotrichum laeve, commonly known as 'smooth aster'. The cultivar I'm growing (which I think is more often found in the trade than the straight species) is called 'Bluebird'. The only other aster I've grown has been Symphyotrichum oblongifolium 'October Skies' (aromatic aster), which has a very bushy growth habit. I naively assumed that Bluebird might grow the same way. So imagine my surprise when this single, unbranched stem shot up about 5 feet in the air! It's recently shown some inclinations of branching near the top - and another stem has emerged from the ground at the base of the plant - so I'm thinking perhaps a clump will develop after all. 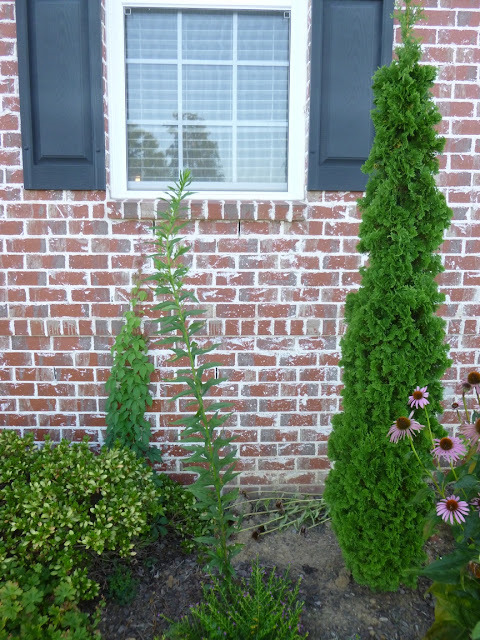 For now, it looks a bit funny all by its lonesome growing next to a DeGroot's Spire arborvitae, but I have to respect its toughness and tenacity. When gale force winds toppled a couple of purple coneflowers (Echinacea purpurea) and sent a top-heavy cucumber-leaf sunflower (Helianthus debilis subsp. cucumerifolius) toppling to earth, the Bluebird swayed and bent a little, but ultimately stayed upright (though perhaps looking a bit more...sinuous than before). PS - If you don't want to miss the flowers either, sign up for a free email subscription and you'll get all the updates on Bluebird and everything else in the Garden of Aaron straight to your inbox!